Looking out from the remains of the old lifeboat slipway on the chilly windswept northern tip of Hilbre Island it is hard to know what centuary it is. A thick mist (not viscous enough to be called a fog) obscures the offshore wind turbines from view, No planes can be seen or heard through the thick low clouds. There is nothing in view that you could assign to a specific age or time. Just birds, seals, waves and sandstone rocks. In fact time is currently an irrelevance. It matters not if I have an appointment elsewhere or I am requested to go somewhere. The tide is in and I am going nowhere until it has gone out. This is Hilbre Time. It is either high or low water, light or dark. Nothing else really matters. I am contemplating this from inside my fleecey lined parka and under a wooly hat as, even though I am here for a chance encounter with some spring migrants, it still feels distinctly wintery. 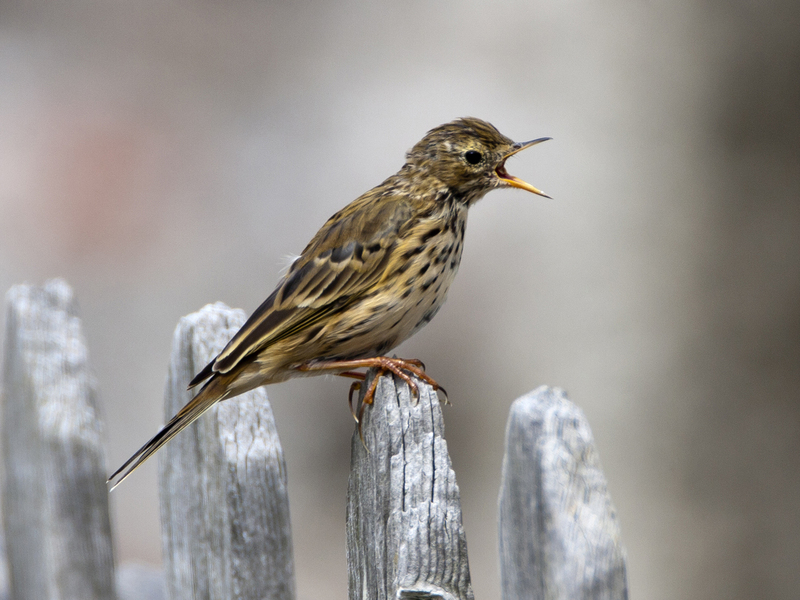 There are plenty of migrants on the island, masses of Meadow Pipits have been piling through. They are often overlooked for the more traditional (Swallow) or colourful (Wheatear) migrants so I make an effort to get some pictures of these birds. The salt heavy breeze has bleached the fence from a yellowish beige to an ash grey and I fear that all this time spent on these islands in this wind I'll start to look as weathered as the local woodwork. On the other side of the fence is some scrubby vegetation that is just coming into leaf. An incongruous sight in this still chilly weather. In the tangle of twigs I spot a swift darting flash of tiny bird. 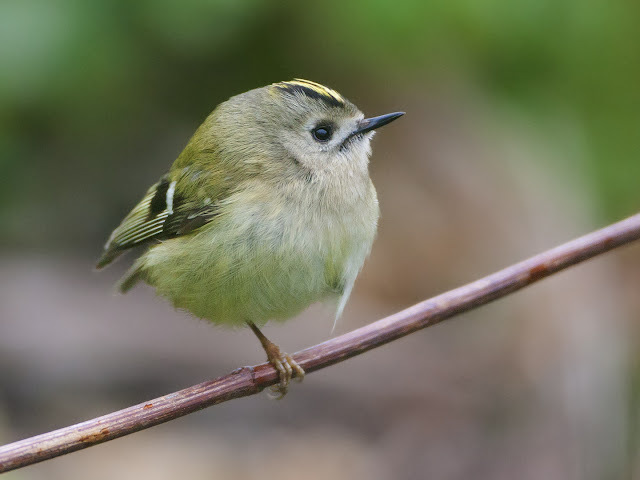 Waiting for a while I pick it up again and get a good enough view to recognise a Goldcrest. These delicate birds are actually hard as nails. 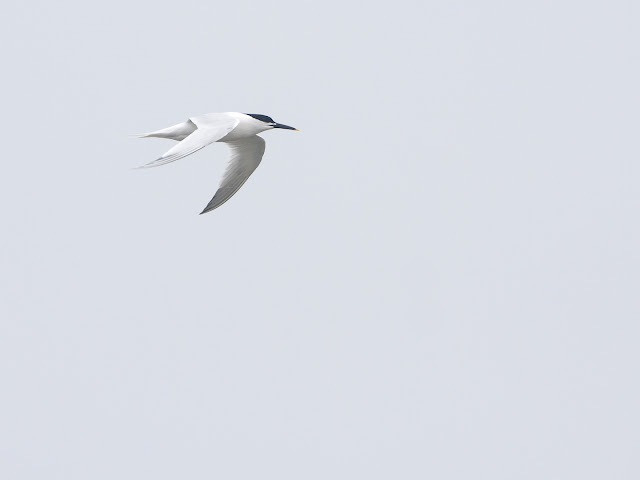 It is difficult to imagine these birds making the trip over open water to these islands but that is exactly what this little battler has done. The metal ring on its left leg is testament to the work of the boys from the Hilbre Bird Obs. It is zipping about gleaning grubs from the buds. It won't keep still! It is so fast that it is almost impossible to get a clear shot. Time, I remind myself, a decent picture will take time. I stand in the rain and wait. It's worth the time spent. 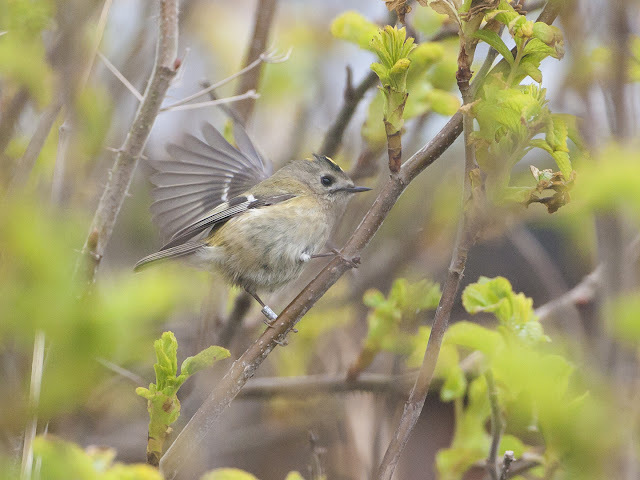 Once I am satisfied with the 'Crest pictures I drift down towards the Birds Obs. In a garden I spot what I was really after today. 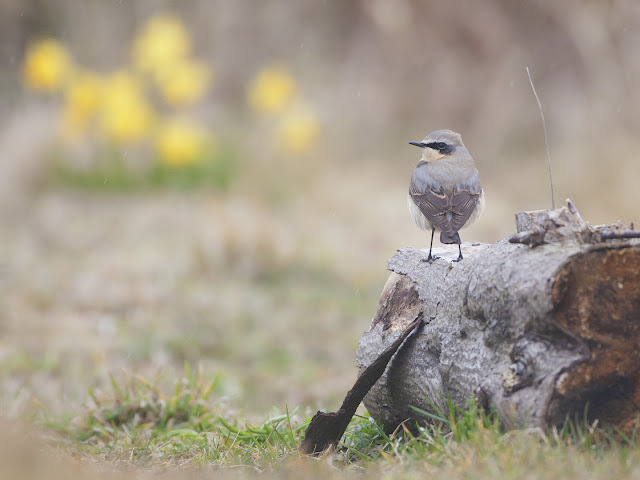 A Wheatear. I love these birds, they are possibly my favourite sign of spring. They have been late this year, migration stalled by the cold north east winds that have dominated our weather for so long. At last they are here. I knew they would come, spring had to arrive eventually. It was just a matter of time. In the background I notice recently flowered dafodils, I frame the picture so that the Wheatear and the dafs are in shot, a double whammy of spring. It is still a bit distant and remains so for the time I spend leaning on the bleached fence. I walk back towards the north end. 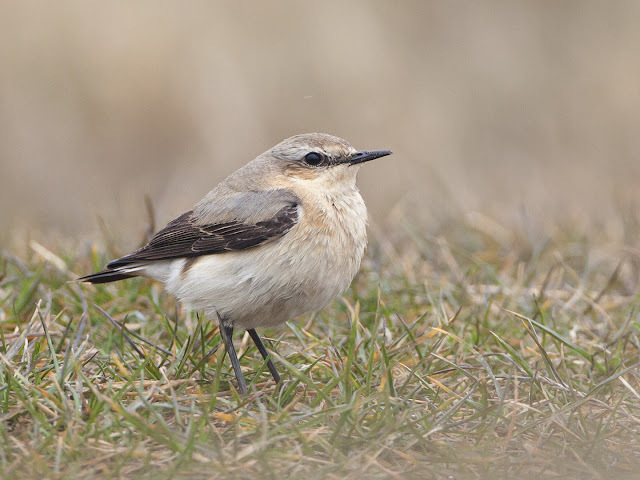 I bump into another Wheatear. This one is more confiding and in no time at all I have the portrait of spring I was looking for. My first Wheatear pictures of 2013 are in the bag, roughly a month later than planned, but it was just a matter of time. Hilbre Time. Excellent post Matt; and excellent pictures too.